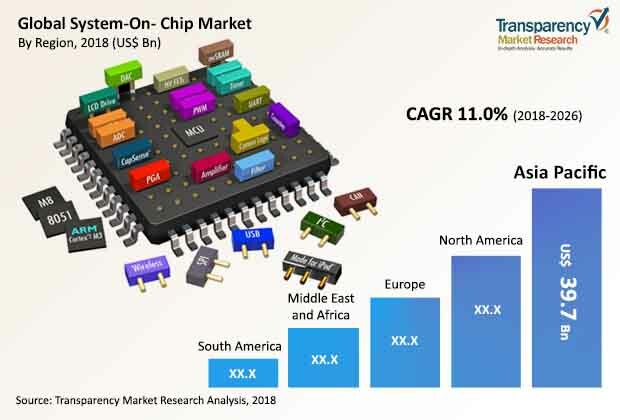 According to a new market report pertaining to the system-on-chip market, published by Transparency Market Research, the global system-on-chip market is expected to reach US$ 206.79 Bn by 2026, expanding at a CAGR of 11.0% from 2018 to 2026. According to the report, the global market will continue to be influenced by a range of macroeconomic and industry-specific factors. Asia Pacific will continue to be at the forefront of global demand, with the market in the region rising at a CAGR of 12.6% during the forecast period from 2018 to 2026. Smartphones application of system-on-chip is anticipated to significantly drive the global system-on-chip market across the globe. Increasing adoption of smartphones and PC/laptops due to the requirement of faster speed and all on a single chip, is witnessing noteworthy growth around the globe. The global system-on-chip market is showing significant growth due to its rising adoption in the consumer electronics and telecommunication industry. The rising demand and adoption of advance technologies to obtain faster response and lower power consumption in compact devices are estimated to contribute to the growth of the system-on-chip market in the coming years. Key players in the market are continuously enhancing their research and development expertise to design advanced system-on-chip required in various applications such as smartphones, PC/laptops, networking devices, game consoles, digital cameras, and others. Also its usage in end use industries such as consumer electronics, telecommunication, healthcare, automotive, aerospace and defense, industrial and others, have influenced the growth of the system-on-chip market. The global system-on-chip market is broadly segmented by type, application, and end-use industry. According to the research study, mixed type of signal segment held the maximum market share and is anticipated to show a CAGR of above 12.1% through 2026. In terms of revenue, mixed type of signal’s contribution is primarily due to its extensive usage in various smart devices and the segment is anticipated to remain dominant over the forecast period. Digital type of signals segment is expected to expand at a CAGR of about 10.9%, followed by analog signals. Others that includes radio frequency and near field communication is expected to expand at a lower rate compared to other segments over the forecast period. As per TMR analysis, application of system-on-chip’s in smartphones is anticipated to grab maximum market share in 2018 and a similar trend is expected to be seen over the forecast period. Commercial usage of system-on-chips in consumer electronics, telecommunication, and healthcare, is forecasted to see dominant growth over other segments such as aerospace & defense, automotive, industrial and others for system-on-chips in the global market. The consumer electronics industry showed significant market share in 2017 due to the increasing application in end use industries, and a similar trend is anticipated to be seen over the forecast period. Usage of system-on-chips in medical devices is anticipated to witness highest CAGR growth in the healthcare industry. Other industries such as aerospace and defense, automotive, and pharmaceuticals and others are expected to show decent growth over the forecast period. Asia Pacific (APAC) held the largest market revenue share for the system-on-chip market in 2017 and this region is anticipated to grow at a remarkable CAGR of 12.6% during the forecast period. Consumer electronics and the need for robust system-on-chip for fast response devices is anticipated to drive the system-on-chip market across APAC. Analyzing the Asia Pacific system-on-chip market at country level, in 2017, China held majority of revenue share of the Asia Pacific system-on-chip market followed by India. Also, in terms of revenue generation, India is anticipated to expand at a significant CAGR over the forecast period. Rising demand for smart devices by the growing population across the country is likely to create lucrative market opportunity for system-on-chips. The research study includes profiles of leading companies operating in the global system-on-chip market. Market players have been profiled in terms of attributes such as company overview, financial overview, business strategies, and recent developments. Some of the key players in the system-on-chip market are Apple Inc., Broadcom Limited, Infineon Technologies, Intel Corporation, Qualcomm Inc., Samsung Electronics Co. Ltd., STMicroelectronics N.V., Taiwan Semiconductor Manufacturing Co. Ltd., Toshiba Corporation, MediaTek Inc., Maxim Integrated Products, Inc., Microchip Technology Inc., Texas Instruments, and ON Semiconductor. Various business strategies are being adopted by the market leaders. Companies are focusing on expanding their business by developing strategic partnerships and by offering innovative solutions in the end-use market.